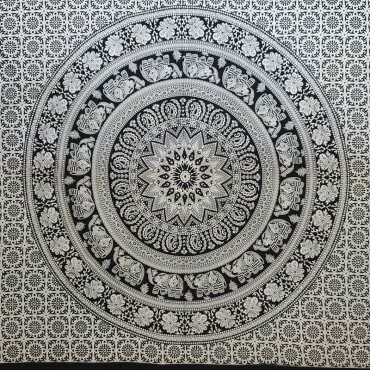 ﻿﻿﻿Here we present our largest sized 100% Cotton Tapestries/Wall Hangings. Open your door to a colourful home! Free UK Postage. Amazonas Gifts presents a beautiful, colourful, vibrant selection of Fair Trade Tapestries/Wall Hangings.Style: Tibet BuddhaColour: Tie Dyed, Mainly Purple with splashes of Red and blue. Black Print. FREE UK FIRST CLASS POSTAGE - WE ARE A UK SELLERSize approx: Medium – Single/twin Size: 2.1m x 1.4m / 82 inch x 58 Inch.Large – Double/Queen Size: 2.4m x 2.1 m / 94”x 84”All edges are Hemmed. &nbs..
Amazonas Gifts presents a beautiful, colourful, vibrant selection of Fair Trade Tapestries/Wall Hangings.Style: Elephant, Tiger MandalaColour: Black Print. Cream/Gold/White BackgroundFREE UK FIRST CLASS POSTAGE - WE ARE A UK SELLERSize approx: Medium – Single/twin Size: 2.1m x 1.4m / 82 inch x 58 Inch.Large – Double/Queen Size: 2.4m x 2.1 m / 94”x 84”All edges are Hemmed. ..
Amazonas Gifts presents a beautiful, colourful, vibrant selection of Fair Trade Tapestries/Wall Hangings.Style: Elephant MandalaColour: Black Print. Cream/Gold/White BackgroundFREE UK FIRST CLASS POSTAGE - WE ARE A UK SELLERSize approx: Medium – Single/twin Size: 2.1m x 1.4m / 82 inch x 58 Inch.Large – Double/Queen Size: 2.4m x 2.1 m / 94”x 84”All edges are Hemmed. ..
Amazonas Gifts presents a beautiful, colourful, vibrant selection of Fair Trade Tapestries/Wall Hangings. 7 Chakras - Each of the seven centres of spiritual power in the human body.Tie Dye - Multi-ColourThese stunning handmade screen printed pieces of Art can be used as a wall hanging, bedspread, throw, picnic/beach blanket, sarong, curtains or tablecloth. Add some colour to your home, office, dorm, yoga/meditation space or caravan. FREE UK FIRST CLASS POSTAGE - WE ARE ..
Amazonas Gifts presents a beautiful, colourful, vibrant selection of Fair Trade Tapestries/Wall Hangings.Style: Zodiac, HoroscopeColour: Mainly Green centre, Black edges. Red Sun. Black Print. FREE UK FIRST CLASS POSTAGE - WE ARE A UK SELLERSize approx: Medium – Single/twin Size: 2.1m x 1.4m / 82 inch x 58 Inch. £14.95Large – Double/Queen Size: 2.4m x 2.1 m / 94”x 84”. £18.95All edges are Hemmed. Wash separately in cold water or dry clean. As this product is handma..
Amazonas Gifts presents a beautiful, colourful, vibrant selection of Fair Trade Tapestries/Wall Hangings.Style: Elephant Colour: Black Print. Mainly Orange with splashes of yellow. Tie DyedFREE UK FIRST CLASS POSTAGE - WE ARE A UK SELLERSize approx: Medium – Single/twin Size: 2.1m x 1.4m / 82 inch x 58 Inch.Large – Double/Queen Size: 2.4m x 2.1 m / 94”x 84”All edges are Hemmed. &..
Amazonas Gifts presents a beautiful, colourful, vibrant selection of Fair Trade Tapestries/Wall Hangings.Style: Elephant Colour: Black Print. Mainly Purple with splashes of dark blue. Tie DyedFREE UK FIRST CLASS POSTAGE - WE ARE A UK SELLERSize approx: Medium – Single/twin Size: 2.1m x 1.4m / 82 inch x 58 Inch.Large – Double/Queen Size: 2.4m x 2.1 m / 94”x 84”All edges are Hemmed. ..
Amazonas Gifts presents a beautiful, colourful, vibrant selection of Fair Trade Tapestries/Wall Hangings.Style: Zodiac, HoroscopeColour: Mainly Purple centre, black edges. Red Sun. Black Print. FREE UK FIRST CLASS POSTAGE - WE ARE A UK SELLERSize approx: Medium – Single/twin Size: 2.1m x 1.4m / 82 inch x 58 Inch. £14.95Large – Double/Queen Size: 2.4m x 2.1 m / 94”x 84”. £18.95All edges are Hemmed. Wash separately in cold water or dry clean. As this product is handm..
Amazonas Gifts presents a beautiful, colourful, vibrant selection of Fair Trade Tapestries/Wall Hangings.Style: Pixie, Fairy, ElfColour: Tie Dye, Mainly Purple with splashes of colour. Black Print. FREE UK FIRST CLASS POSTAGE - WE ARE A UK SELLERSize approx: Medium – Single/twin Size: 2.1m x 1.4m / 82 inch x 58 Inch. £14.95Large – Double/Queen Size: 2.4m x 2.1 m / 94”x 84”. £18.95All edges are Hemmed. Wash separately in cold water or dry clean. As this product is h..